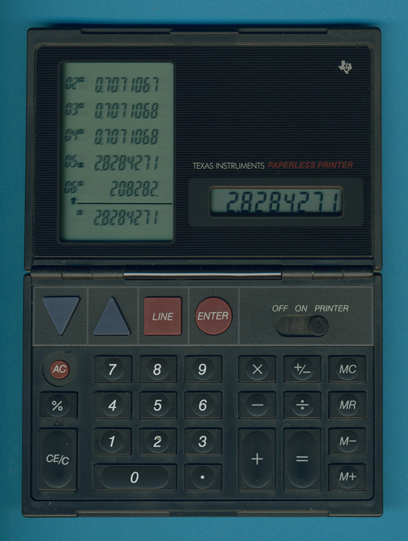 Texas Instruments introduced in 1988 a revolutionary concept: The TI-2800 Paperless Printer! The calculator works like the known printing desktops e.g. the TI-5010. All calculations are done on the main display. Instead the usual printout on a paper the results are scrolled through a secondary display with 6 lines. A maximum of 99 lines could be stored and scrolled up and down with the arrow keys. Dismantling this foldable TI-2800 Paperless Printer manufactured in November 1988 by Inventec Corporation in Taiwan reveals an interesting design with two large printed circuit boards (PCBs) in a compact package. Compared with a simple desktop calculator the internal construction of the Paperless Printer was much more difficult. In each of the two shells of the housing a large, double-sided PCB was integrated. The Main PCB is centered around a Toshiba T7724 microcontroller with an external 2k*8 Static RAM, while the Display PCB used a Toshiba T7971 chip to control the two individual LC Displays. The TI-2800 Paperless Printer was soon replaced with the TI-5038. A big step in cost reduction was achieved with the TI-5028. Don't miss the TI-2300 introduced in 1988. © Joerg Woerner, May 9, 2002. No reprints without written permission.